While walking north on Tenth Avenue in the West Chelsea section of New York, I came upon a show at Lori Bookstein Fine Art without any previous knowledge of the artist, a sculptor named Hiroyuki Hamada. As I gazed at the various works in the gallery, I realized this was the way I used to look at art 35 years ago when I began writing criticism. At the time, there was still the possibility of coincidence and surprise without losing contact with the critical discourse. This was before money and trends took over in the 1980s. It was a time when real collectors (not investors) had a voice and believed contemporary art was not only meaningful in its own right, but was linked to the on-going process of art history. What about the sculpture of Hiroyuki Hamada? The works in the exhibition are numbered, stead of titled. They are constructed in resin and painted in a way that makes them appear both complex and simple. They are concerned with form and imagination. They are not slick, but hold an integral sense of completeness. By completeness, I mean the forms are convincing in the manner they are finished. There is nothing more to add or subtract. They are what they are. For example, number #81 is a single reclining form composed of two shapes; one is an extended white beam with an uplifted curved edge, and the other is a black bulbous shape resembling a boxing glove. That’s all. There is little more to be said other than proposing that time endures due to the significance of the pause-a premise deployed throughout the plays of Harold Pinter. Each shape appears to hold another in place. In that moment, a ingenious hiatus that extends beyond language. Perhaps, I am attracted to work that exists beyond the manner in which the form emerges. Hamada’s work retains this absence, after all, and powerfully so. Two others, #72 and #79, immediately caught my eye. The first is large work painted white, possibly the largest in the show. Although the form consists of three abstract shapes, it reminded me of a woman sitting up in bed. Its demeanor attracted me. Somehow with Hamada these kinds of inquiries are less to the point than simply absorbing the mystery of the form. The second work is reclining and painted in burnt umber, a deep earth color. All of Hamada’ sculptures are made from parts. This was one of the simplest: a conical rise at the end of a mud-like form, reminiscent of Noguchi. I was taken by its relaxation, by the fact that I only had to observe it, nothing else. 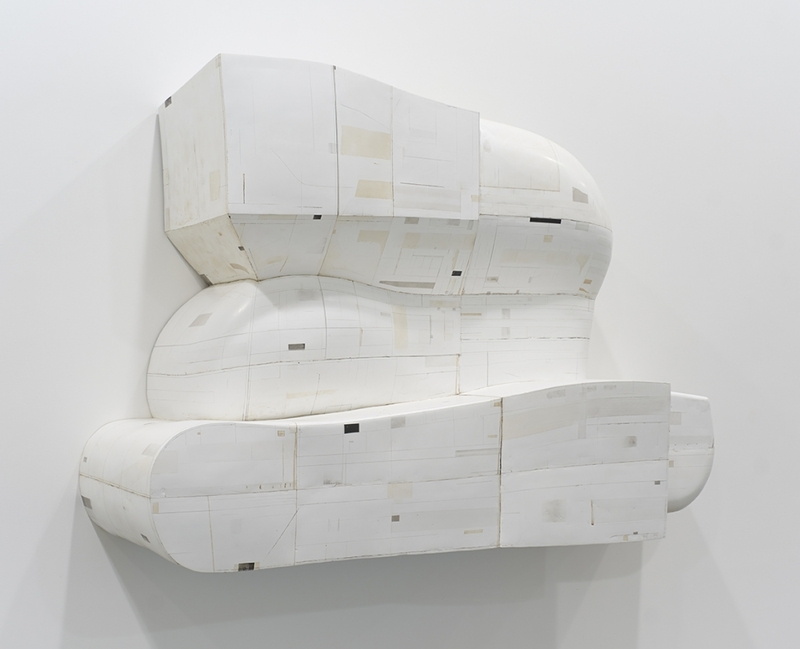 Finally, one of the most complex works was #73, a wall piece painted in white, constructed in five parts Duchamp’s idea of “mechanical parts and visceral organs.” It holds no function other than to reveal the fractures in the interstices between the angles. I could not easily escape it. Nor did I want to. I was comfortable with the ease of its complexity, knowing the incalculable knowledge it must have taken to create such an ambivalent mystery.